Something to think about …. “The Destruction of America”!! Is it too cynical to say that this quote will always be poignant in American politics? 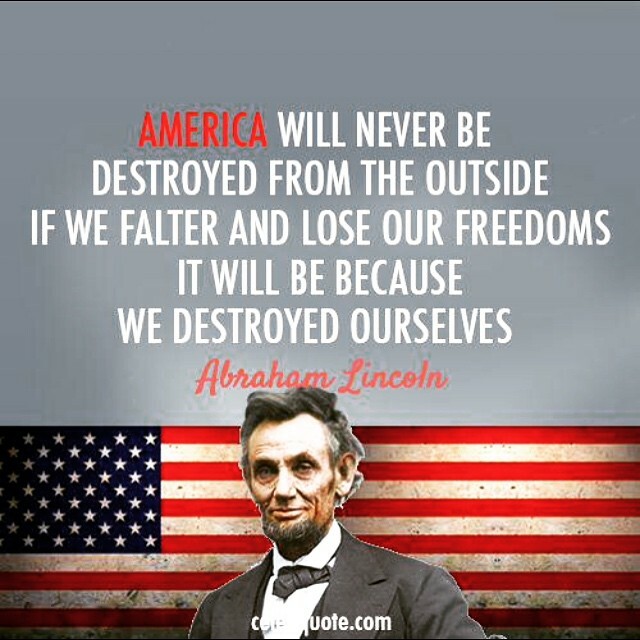 Can you truly look at the current state of affairs and refute what Mr. Lincoln said? I’m feeling pessimistic and truly don’t see a way back. Has America crossed the point of no return? Prophetic words indeed … in my humble opinion. Abraham Lincoln (February 12, 1809 – April 15, 1865) was the 16th President of the United States, serving from March 1861 until his assassination in April 1865. Lincoln led the United States through its Civil War — its bloodiest war and its greatest moral, constitutional, and political crisis. In doing so, he preserved the Union, abolished slavery, strengthened the federal government, and modernized the economy. An exceptionally astute politician deeply involved with power issues in each state, Lincoln reached out to the War Democrats and managed his own re-election campaign in the 1864 presidential election. Anticipating the war’s conclusion, Lincoln pushed a moderate view of Reconstruction, seeking to reunite the nation speedily through a policy of generous reconciliation in the face of lingering and bitter divisiveness. On April 15, 1865, six days after the surrender of Confederate commanding general Robert E. Lee, Lincoln was assassinated by John Wilkes Booth, a Confederate sympathizer. Lincoln has been consistently ranked both by scholars and the public as one of the three greatest U.S. presidents. At what point shall we expect the approach of danger? By what means shall we fortify against it? Shall we expect some transatlantic military giant, to step the Ocean, and crush us at a blow? I answer, if it ever reach us, it must spring up amongst us. It cannot come from abroad. As a nation of freemen, we must live through all time, or die by suicide.